Once upon a time in 2009, I wrote a post about Strawberry and Dark Chocolate Panna Cotta Shots. It was my sixth post. As I had tried the whole layering-in-a-glass thing then, I decided to try unmoulding my panna cotta for this challenge. I have to admit that I screwed up the panna cotta part of this challenge and didn't try it again. I must have got my sheet gelatine conversions wrong because it was like rubber. I will defnitely try making it again at some point in the future as I like panna cotta. The roses didn't come out quite how I wanted them but I'm pleased they're at least recognisable as roses. To make them I spread the batter thinly over a baking sheet and then baked it like that. When it came out of the oven and was still hot I used heart shaped cutters in two sizes to cut out petals and then constructed the roses from those. Another time I would spread the batter even thinner in the middle as it was a bit greasy and thick. The recipe pdf is on the main DK page here. THOSE ARE BEAUTIFUL!!!! Nice job with the challenge!!! Very creative! Oh WOW! Florentine roses! I'm impressed! How wonderfully creative. I love your roses! These roses are inspiring wonderful effort great work. And I love the last photo bravo to you I think I will a rose that is so pretty. 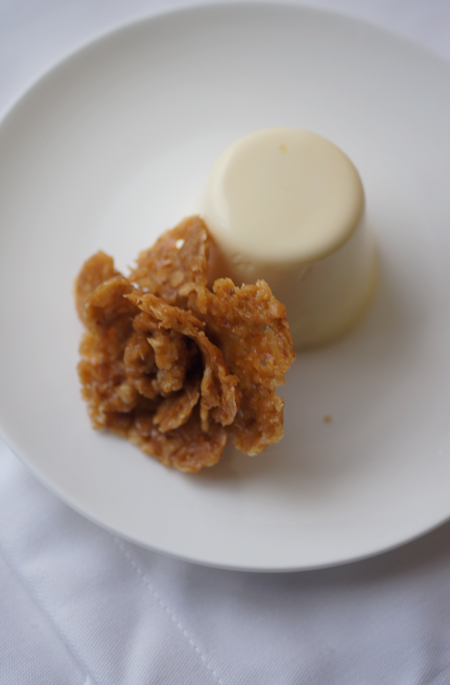 I love the rose-shaped florentines and your panna cotta is simple and beautiful. Well done, Emma! Those little roses may have not came out how you wanted but they are so adorable! I wish I had thought to try to do something like that (though I doubt they would have came out as good as yours)! That is the cutest idea! Those roses are so amazing!! I am so impressed. Sorry the panna cotta's consistency wasn't quite right, but I have to say, it all looks wonderful. Great job. Wow! How cute your florentines are and the pannacotta looks perfect. I had some batches of panna cotta come out much looser than others using the same proportions, so I think it depends on the flavourings and what kind of base you use. p.s. Your macarons below are gorgeous--looks like you've definitely got the hang of it. Your roses are so beautiful! That was such a brilliant idea. 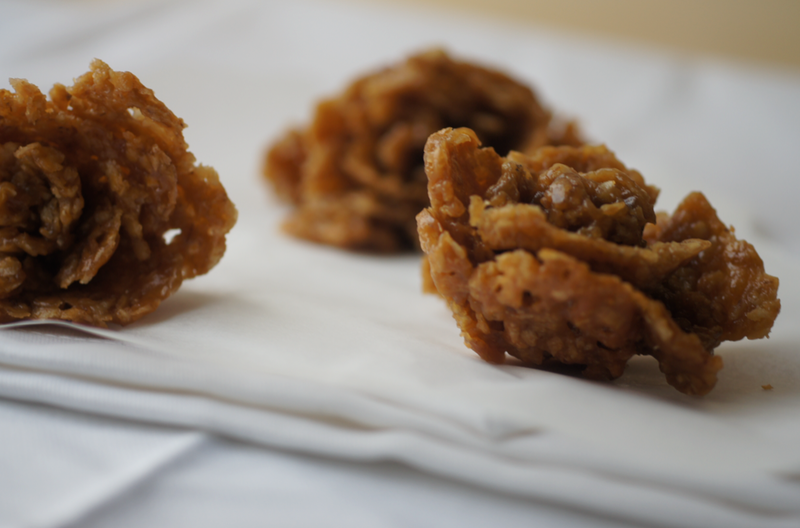 You should try florentines the Aussie way one day. You'll love experimenting with the flavours. I hope you do try the panna cotta again. Yours look beautiful, but I know how texture can throw taste off...! You florentines are amazing. What inspired you to try something so amazing? I really am in awe! I noticed right away they were rosette's ... petit, kawaii...adorable. I've only eaten panna cotta.. but have not made it yet... I wonder if I can fuse some kind of (matcha) east meets west? Maybe the panna cotta didn't turn out okay texture-wise, but your florentine roses are lovely. How original and probably not too easy as it would have meant working very quickly. 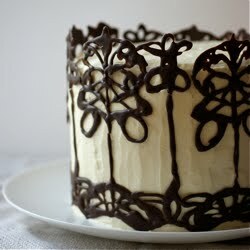 Very elegant... love how you've shaped roses out of that rather odd florentine recipe! beautiful! I really like those Florentines roses. Well, done. OMg rose is wonderful idea... will adopt this soon..both panna cotta and the florentine looks fabulous. Wow very impressive, they all look delicious!! Wow, that's an incredibly creative variation on a typical florentine! I've never seen them made into anything like this. Beautiful work! I love a florentine roses! What a pretty and creative way to present them. Sorry to hear the panna cotta didn't work out, the first time I made it I put in too little, and attempted to un-mould it. It was a mess! Wow those roses are gorgeous! What talent! And your panna cotta turned out beautifully! Mine didn't unmold that well! The florentine roses are a really cute idea. I also used sheet gelatine, and my panna cotta turned out to soft. I had to reheat it again and add another sheet. There are always so many different conversions, so it's easy to get it wrong. Too bad that you were not happy with your panna cotta, but your florentines are lovely! 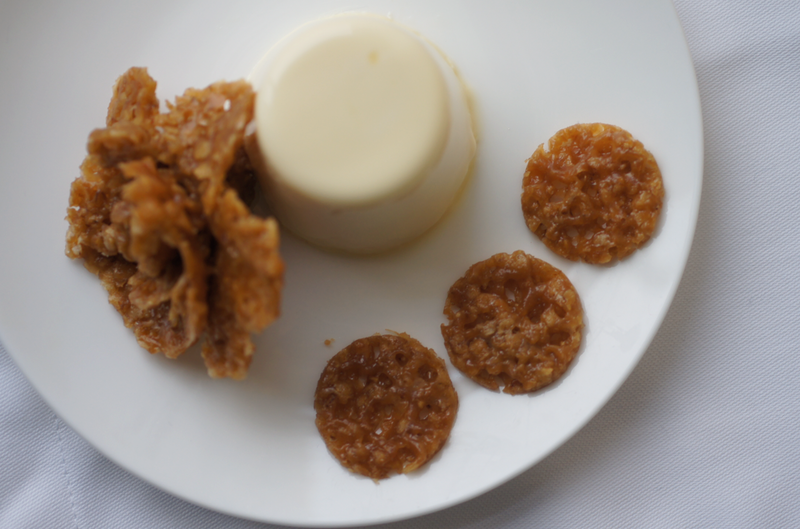 The panna cotta looks great, so silky and smooth and I love the idea of serving it with florentines too. Genius! Great idea to roll them up like flowers, it looks amazing!